‘Switch off Coal and Switch on Renewables’ is the very clear message being sent to state and federal Governments this Earth Hour by community climate activists who have occupied Hazelwood Power Station in Victoria’s Latrobe Valley today. Spokesperson for the group Louise Morris said, “We are facing a climate emergency and if we are serious about tackling climate change, the first step is to Switch off Coal and Switch onto Renewables. “By shutting down Hazelwood this year, we could achieve this 5% target immediately, and then adopt proper emission reduction targets as the climate science demands. Its time to get down to the real business of transitioning Australia away from polluting fossil fuels and switching onto renewable energy,” said Ms Morris. “Governments are happy to provide token support for climate change by switching off their lights for an hour, once a year, but if they are serious on climate change it’s clear Hazelwood needs to be decommissioned this year. Every hour needs to be Earth Hour. 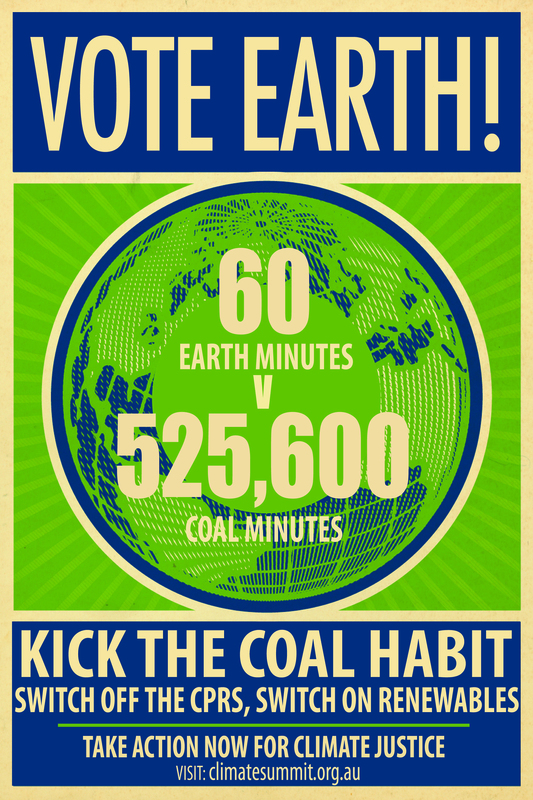 If we are to avoid catastrophic climate change and have a job rich renewable energy future we need to act now. This is not a technical or economic problem we just need the political will to switch off coal and switch onto renewable energy.” Concluded Louise Morris. 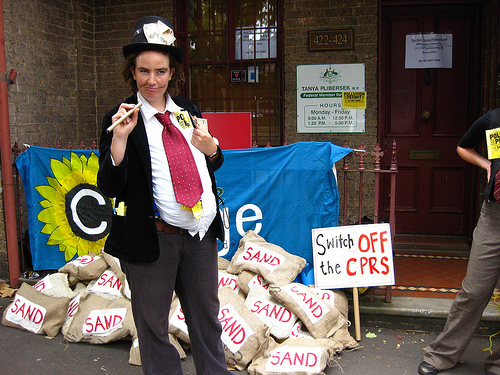 Community Climate Action Groups across Australia are today holding protests at the offices of over 30 Federal MPs to protest the failure of the Federal Government’s Carbon Pollution Reduction Scheme (CPRS). The protestors are calling on the Government not to pursue a scheme that rewards big polluters, fails to commit to adequate emission reduction targets, and locks us into catastrophic climate change. “We are deeply concerned that the Carbon Pollution Reduction Scheme takes a ‘business as usual’ approach to the urgent threat of climate change, and does not commit to the emissions reduction targets that the science tells us are necessary to avoid dangerous climate change,” said Moira Williams from Climate Action Newtown. “Big polluting industries like coal and aluminum must be made to cut emissions rapidly and immediately. The CPRS will give away billions in concessions without even achieving the necessary pollution cuts. In fact, emissions are likely to continue rising under this scheme,” continued Ms. Williams. The protests are twice the size of similar actions that took place last year following the announcement of the 5-15% emissions reduction target and the release of the White Paper for the CPRS. Protest organisers attribute the increase to the continued failure of the Government to meet the clear need for more decisive action. “It is an absolute disgrace that when faced with the threat of catastrophic climate change, our leaders are pandering to the powerful fossil fuel and mining lobbies, and continuing to ignore urgent scientific advice and widespread community alarm about the most important issue of our time,” said Pablo Brait from Yarra Climate Action Now. What: Protests opposing the Carbon Pollution Reduction Scheme. Don’t leave it to the market; leave it in the ground! 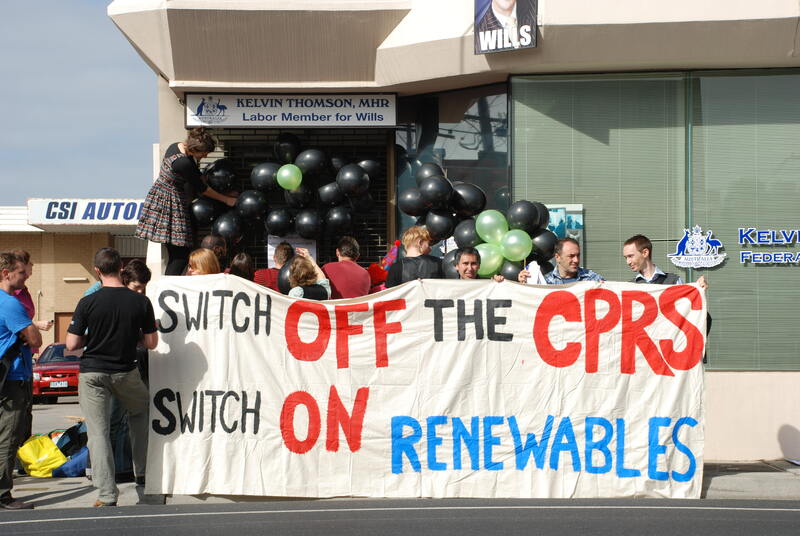 Tomorrow, Friday March 27th, is the first national community actions to Switch off the CPRS and Switch On Renewables. There are so many exciting actions planned in every state and territory. Next week we’ll be telling the NSW Minerals Council, whose financial and political has made the proposed Carbon Pollution Reduction Scheme so favourable for polluters: “We won’t leave it to the market; we’ll leave coal in the ground.” If you’re in Sydney, come along! 2009 is the most important year in our history. We have a short window of opportunity to drastically cut carbon emissions and avert dangerous climate change that will have severe consequences forever. As we speak, Australian farmers are ripping crops out of the ground due to low rainfall. This will only worsen under climate change. We face a climate emergency. Yet our government has failed to deliver strong action on climate change. It has bowed to the lobbyists of polluting industries instead of securing the economy, livelihoods and futures of the people it is meant to represent. The Carbon Pollution Reduction Scheme (CPRS) will hand over the right to pollute our atmosphere to the very companies that profit the most from polluting it. It sets a measly emissions reduction target and hands billions of dollars in concessions to fossil fuel industries – that can ‘offset’ their emissions overseas. Instead of a Carbon Polluters Rewards Scam, we need immediate investment in renewable energy, which will create thousands of green jobs. We want support for affected workers and communities in phasing out dangerous fossil fuels. Australia is an innovative nation and well-placed to be a leader in the renewables industry. Make sure we turn the tide of climate change, and activate clean, sustainable solutions for a safe climate future. The Government is pursuing a climate change policy that will not result in swift and effective emissions reductions. We have held-hands around parliament, and now its time to take our protest directly to our elected representatives. The Exposure Draft Legislation for the Carbon Pollution Reduction Scheme will be released in the coming weeks. Join communities around Australia sitting-in at their MP’s offices to demand better. On this website, you can download a simple guide to help you plan your protest. You can also visit Flickr and see how colourful, fun and family-friendly sit-ins can be. If you’re on Facebook, find the March 27th events here. There are other resources on this site to help you, and plans are already being made right around the country. Be part of history and take action to protect our children’s future. Our intention was to deliver 19 black balloons to Kelvin Thomson – when we found the shutters closed instead we filled up the alcove with 300 balloons. Thanks to Andrea Rassell for photos. Community Climate Action Groups today “stepped in” to over 30 corporate and MPs’ offices across the country to oppose the Federal Government’s Carbon Pollution Reduction Scheme (CPRS). Protesters from Climate Change Balmain-Rozelle rallied outside Tanya Plibersek’s office in Surry Hills wielding banners saying “Switch off the CPRS. Switch on Renewables”. They handed out ‘pollution permits’ to the public. Priced at $45 per tonne these permits are virtually free to the carbon corporates. Major carbon emitters qualify for 90% discounts and heavy polluters score cash backs. Gayle continued, “Today is the eve of Earth Hour when millions of Australians will turn off their lights in a show of support for strong action on climate change. But we need to do much more than turn off our lights if we are to tackle climate change. The planet is warming at an accelerating rate and if we don’t act now we will face irreversible consequences”. Climate Change Balmain-Rozelle, along with 150 climate action groups across Australia, are calling for direct Federal Government investment in renewable energy to achieve 100% renewables by 2020, a moratorium on coal and just sector-by-sector transition plans to green jobs. The protests are part of a national day of action against the Scheme, the dismally low emissions reduction target, rewards to big polluters and failure to solve the climate crisis. In Sydney climate action groups targeted Anthony Albanese, Peter Garrett and Maxine McKew. Politicians can expect the pressure to build in the lead up to international December negotiations in Copenhagen. Australians from across the country will unite today as part of a National Day of Climate Action, calling on the Federal Government to switch off the 5% Carbon Pollution Reduction Scheme (CPRS) and switch on strong emissions reduction targets, renewable energy and green jobs. Hobart residents will gather at their Federal Labor MP Duncan Kerr’s Office to tell him that 5% is not enough and the community will not allow the Government to legislate a target that takes away their right to a safe climate. “5% is not enough. This target is a death sentence for the planet and will seriously undermine the chance of a global agreement on climate change. Climate change is already affecting millions of people’s lives around the world today. If we do not have strong government action then all people will suffer” said Climate Action Hobart Spokesperson and Hobart resident Jess Wright. “Even the most conservative estimates by scientists say we need emissions cuts of 25-40%. To achieve this we need to switch off the 5% CPRS and switch on real targets, renewable energy and green jobs” continued Jess Wright. The Draft Legislation for the CPRS was released on Tuesday 10 March and has been strongly criticised for its weak 5-15% emissions reduction targets, for excluding some polluting industries and providing other big industrial polluters with free carbon pollution credits worth billions of dollars. “The Government has chosen to give the big polluters a free ride at the stake of a safe climate for all Australians. The community demands a CPRS which will deliver real emissions cuts, a new green economy, renewable energy and above all a safe and healthy future” said Climate Action Hobart Spokesperson and Hobart resident Hannah Aulby. “As a young Australian I am deeply concerned about my future, so on this National Day of Action I’m standing together with people from across the country to say that 5% is absolutely not enough!” concluded Hannah Aulby. Climate Action Hobart is a newly formed group of individuals committed to creating positive government and grassroots community action on climate change. Climate Action Hobart is part of an ever growing network of grassroots climate action groups forming right across the country demanding action that secures a safe climate. Photos from “Switch off the CPRS” Actions around Australia. 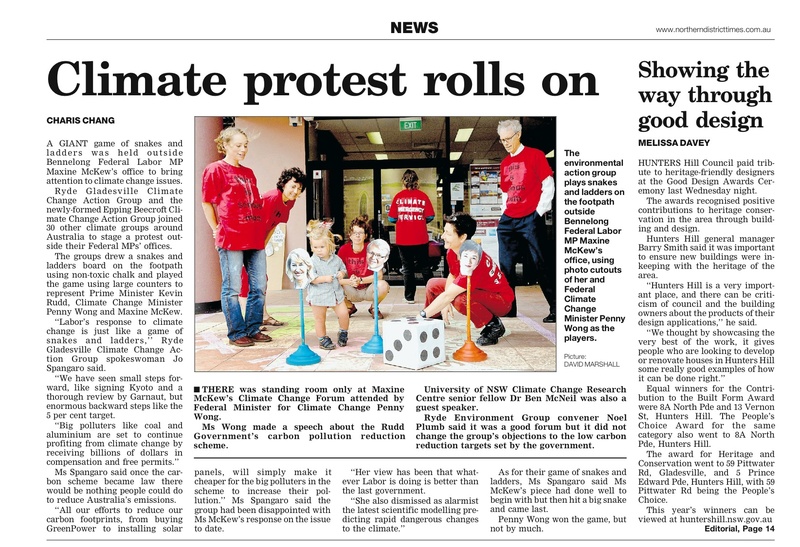 Ryde Gladesville Climate Action Group joined over thirty local climate groups around Australia on Friday 27th March by staging a protest outside the office of local Federal MP Maxine McKew. RGCAG say the government is just playing games with fixing the climate and decided to join in the spirit. 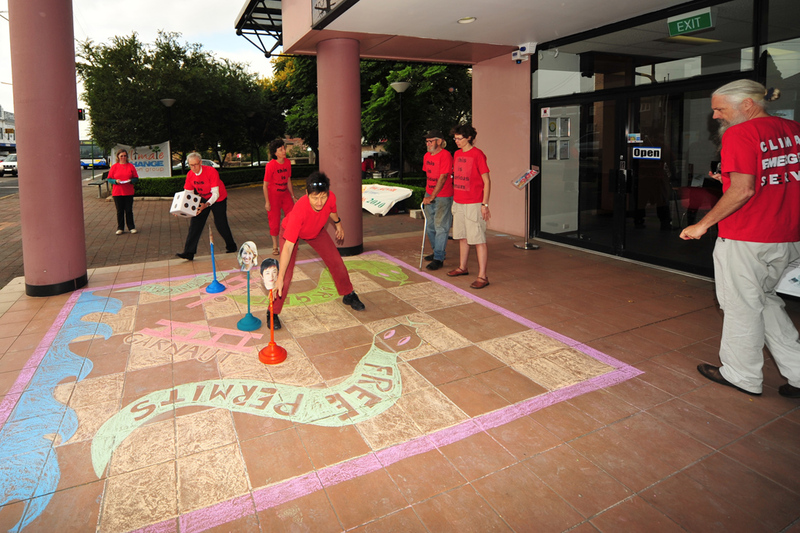 They chalked a huge snakes and ladders board on the pavement outside. “We met with Ms McKew last year but have been pretty disappointed to date. Her view has been that whatever Labor is doing is better than the last government. She also dismissed as alarmist the latest scientific modelling predicting rapid dangerous changes to the climate. Download the PDF of the coverage of this action in the Northern District times here.